We had 8 at the service compared to 12 a year ago. Last year was 2 weeks later , a day with full sunshine and moderating temperatures, about 70 degrees. This year it was much darker, overcast with some drizzle and cooler temperatures in the 50’s. Not an inviting evening at 7pm to go to a service. The service requires both a good acolyte and reader. We had both with Charles and Elizabeth – thanks to both. Charles had 15 candles to extinguish and he did it with ease and a sense of drama as the service progress. The service is 100% scripture so the reader has a challenge. Elizabeth was more than up to it. Unlike the other Easter services, Tenebrae doesn’t relate to a specific Holy Week event as Maundy Thursday, Good Friday and Easter. "Tenebrae" is Latin for shadows. The purpose of the service is to recreate the emotional aspects of the passion story. This is an unusual service with its own Liturgy. There is no music – the readings carry the service. And it’s not from the traditional Gospel readings. It sets a mood and brings you through the Holy Week story through a set of "shadows". The shadows move through the agony of last week- Betrayal, Agony of the Spirit, Denial, Accusation, Crucifixion, Death and Burial – symbolized by the lighted candles. Each shadow generally has a reading from Luke, a Psalm and a hymn. The readings range from Lamentations in the Old Testament to commentary from St Augustine, and at last a reading from Hebrews, in which the theology of God’s saving grace through Jesus Christ is presented for our consideration. The Psalms dominate the service. This service makes use of the power of light and sound to emphasize the darkness of death. 15 candles are lit and extinguished gradually throughout the service until one is left. The candles are snuffed out as Jesus life was. The candle in the end, the Christ candle, is taken away seemingly saying that evil won. 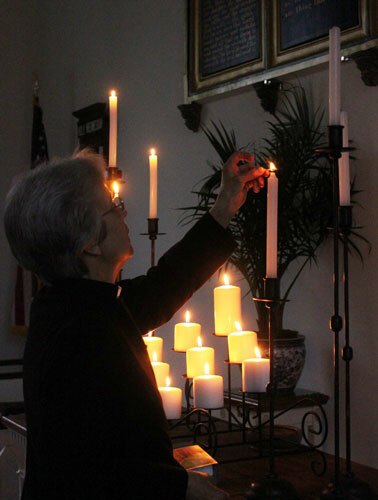 However, dramatically a noise is heard at the end denoting the events of Good Friday and the Christ candle is brought back, a solitary light in the darkness for resurrection into which we depart, indicating that Christ has triumphed.